This copper and glass star light fixture is designed to create elegant lighting to accent your rustic decor. All of our star light fixtures are authentic creations handmade by artisans in Mexico. 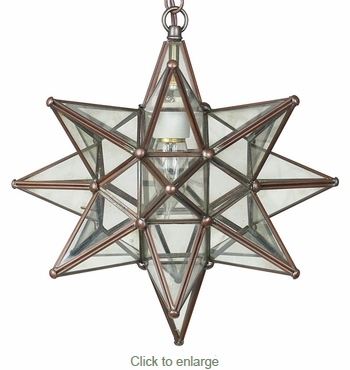 A glass hanging star lantern will enhance any Tuscan, Spanish colonial, or southwest style home.